Harald and his brother Guntar return to Norway to find their father murdered and his throne usurped. They try to take revenge on Sveno, but a traitor amongst them puts both brother's lives at risk. Hercules being heroic in ancient Greece. Senator Varro: If you fail me once again, you'll return to being a slave. Even worse, I'll have your tongue cut out. I'll tear out your eyes. And I will send you into the mines where you'll be whipped, and I will have your wounds, all of them, rubbed with salt. 71 B.C. during the rebellion of Spartacus , a gladiator named Rocca (Dan Vadis)and his band of fellows gladiators (Sal Borgese, Vassili Karis, Pietro Torrisi, Jeff Cameron... )flee from Coliseum. After that ,they save the damsel in distress , a senator 's daughter (Ursula Davis) . They're well received by the senator Varro (Gianni Rizzo) , though are poisoned and locked . Later on, they escape and join forces with Spartacus (Ivano Staccioli, alias John Heston) to fight patrician senator Varro. Spartacus wants return to Tracia and is waiting some ships. Ten gladiators are faced at every turn by Roman army. Meanwhile Rocca falls in love with Daliah(Helga Line) and then must rescue her from slavery and death. The slavers are building an aqueduct and the gladiators attack the detachment. This is the second part in the ¨ Ten gladiators trilogy¨. It packs action, fights , sword-play, adventures and some touches of humor . Ample support cast formed by muscle-men and regular from Western and Peplum as Enzo Fiermonte, Jeff Cameron,Pietro Torrisi who in the 80s as Peter McCoy played several sword and witchery movies and Ricardo Pizzuti as Roman soldier , he's usual in Terence Hill-Spencer movies. As comic relief appears Sal Borgese, a sympathetic secondary playing a deaf-mute. Good production values with spectacular final battle full of extras and stock-shots from previous Roman films . It's shot in Rome, Lazio and Barcelona, Cataluña, because it's a co-production Spanish/ Italian produced by Alfonso Balcazar . Atmospheric score by Carlo Savina with catching musical leitmotif, he's usual of Western and substituting to Angelo Francesco Lavagnino who composed the first entry. Cheesy edition by Bruno Mattei, later famous director of ¨Z¨ Italian films.The motion picture is professionally directed by Nick Nostro. The best installment is the first titled ¨I dice gladiatori(1963) or Ten gladiators¨ by Gianfranco Parolini with Roger Browne, Jose Greci and Dan Vavis as Rocca who dies at the end ; here the gladiators taking on Nero, Gianni Rizzo, and his henchman Tijelinus . 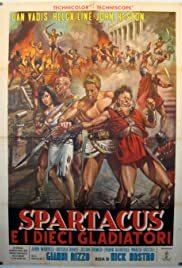 It's followed by ¨Spartacus and ten gladiators¨ and the third outing titled ¨Triumph of ten gladiators or Il Trionfo dei Dieci Gladiators ¨ again by Nick Nostro and Gianni Rizzo as evil villain.